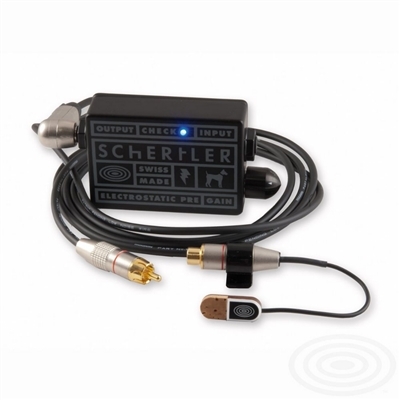 This sensor has been specially designed for use with Maccaferri-Selmer guitars. Based on Lydia technology, STAT-MACC is engineered with a high quality electrostatic microphone inside the transducer. Its cork and cotton fibre construction materials have been specially ed to give natural, high fidelity sound. Fixed between the soundboard and the bridge, it captures only the mechanical vibrations on the instrument and is also highly resistant to feedback. The standard STAT-MACC-SET includes pickup, cable and battery-powered STAT-PRE preamp with volume control.